Naxos’ fertile land and its substantial, in comparison to other Cycladic islands, water resources, ensure prolific farming and agriculture, capable of meeting the islands needs even during the summer months. Naxian products are also exported to Athenian markets. At Livadi, south of Chora, Naxian potatoes renowned for their taste are cultivated. This special variety, which only prospers in fields with plenty of sun and little water, is sought all over Greece. These delicious, small and firm potatoes are one of the most representative products of the Cycladic soil. The island’s valleys, (Eggares, Melanes, Potamia) are covered with fruit bearing trees of every kind. Approximately 40.000 olive trees, grown on Naxos, ensuring the year’s oil, an ingredient fundamental to Greek cuisine. In the area of Tragea alone, where the greatest olive grove of the island is located, there are four olive presses. Pulse (beans, lentils, etc) and few starches complete the island farming produce. During the last few years, cultivation of some biological products is also sustained. Dried figs and herbs from the island’s countryside are additional goods that can be found at the local markets. Since ancient time, Naxos has been the center around which revolved folk lore, myth and legend regarding the grape vine and wine, since is was an important meeting ground for the worship of god Dionysus. 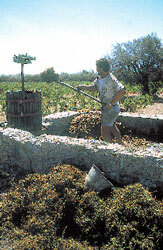 To this day grape cultivation is one of the fundamental occupations of the Naxians. Even though one can find vineyard all over the island, they are primarily located in the mountainous areas of Naxos. Most families have their own vineyard, which is passed down from father to son, and annually produce their own wine and raki. On the island one can also find the winery of “Prompona”, where Naxian wine is bottled. Another famous local drink is the liqueur named Kitro, which is made by distilling the fragrant leaves of the Kiron Tree according to old family recipes. “Naxos Kitron” is one of the three officially State recognized Greek liqueurs. It is characterized by an acute acidic flavor, and is usually taken as an aperitif. This liqueur is served with ice and mixes well with various juices, while it can also become the base for delightful creative cocktails. From the Kitron fruit on the other hand a delicious unique preserve is made, a traditional delight referred to as a “spoon sweet” served to visitors. Now days the Kitron tradition is contin­ued by two families distilleries. 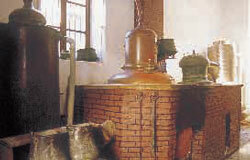 The distillery of Vallindras owned by the Frangoudaki family and the Promponas distilery. You can find their exceptional products, also characterized by their unique packaging, at their central locations on the Sea Front of Chora, as well as the village of Chalki. At this location one can even visit a traditional Kitron distillery. 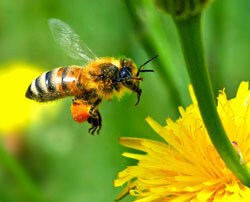 Another agricultural line of work developed on the island is that of apiculture. It is estimated that there are approximately 4.000 beehives on the island, each of which, depending on the year/con­ditions, produces 15 to25 kilos of honey. The Naxian honey is pure, scented with local herbs (primarily thyme). The label with the name of the bee-keeper, on the honey products you will find at various stores around the island, is an additional guarantee that you are buying authentic Naxian honey. Animal breeding – milk products. Stock breeding is another important resource on the island. On Naxos’ highland and midlands hundreds of goats and sheep are bred, while cows and pigs are bred in the plains. The meat of these particular animal stocks is exceptionally tasteful due to the animals’ free grazing, while from their milk the famous Naxian cheeses are made: Graviera Arseniko, Mizithra, and Xinotiro. Graviera is one of Greece’s most traditional table cheeses. Since 1996, Naxos has earned the distinction of Name Origin Protection for its Graviera, made of cow milk. The typical Naxian graviera is firm characterized by a pleasant paleness, while its body is very “space-like” filled with small irregular holes. Cheese makers, salt the “head” in a brine, after it solidifies. It is then left to mature placed on wooden shelves, in specially conditioned areas, or cellars with controlled temperatures, for at least three months during which time a hard, natural exterior shell/crust develops. Usually Graviera comes in “heads” of three or eight kilos. Arseniko (the Masciline) is a hard, yellow, table cheese that is primarily used for grating. On Naxos it is made by combining sheep and goat milk, which is heated and then left to solidify with an enzyme called pytia (ren­net). This mass is then strained and placed in two or four kilo basket-like woven forms. This is how the cheese’s final form is acquired. After the cheese is well drained, and has acquired the necessary solidity, it is soaked once more in “cheese milk” (the liquid left over after the cheese is drained, enhanced with milk). It is then coated with salt and left to mature (without its basket casing) for 60 days. Xinomizithra is a traditional soft cheese, which solidifies and is ready to eat within 24 hours from the milking of the cow. On Naxos an exceptional goat milk xinomizithra is made, rich and creamy with a subtle sour tinge similar to that yogurt. Once milking is completed, the milk is drained and placed in a container, to which a small quantity of natural pytia (enzyme) is added, however it is not heated. 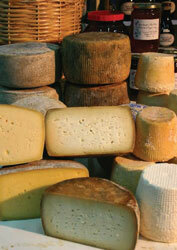 Fermentation follows, which gives the cheese its unique consistency and sour flavor. Lastly it is drained in cloth sheets and place in containers (“tsimiskia”) made of bul­rush. This particular cheese has to be consumed within a few days, for it does not keep well. Xinotiro is basically the same cheese as xinomizithra, with the difference that this one is left to dry out for several weeks until it is fairly hard. In this form it is used for grating or as a table cheese. On the island there are two cheese-making plants which put their bottled milk and other standardized milk products on the market, Naxos graviera being the most circulated.